The Unimog has been stripped down to the chassis in the rear. We will begin building the expedition body shortly. 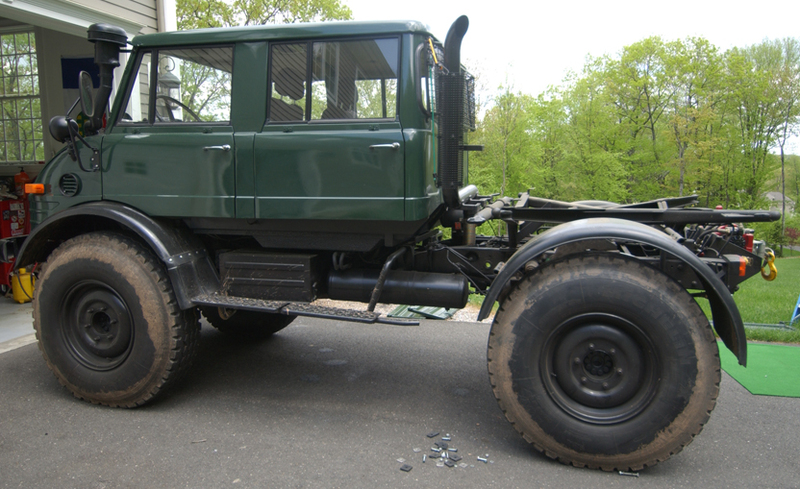 The 3 point mounting system that makes the Unimog famous will be utilized in the new construction. From the photos you can see the steel ball mounting points that we will be using on the corners to mount the frame of our expedition system to. The first step will be to constuct the steel frame in which the aluminum side walls and doors will be mounted to. This part of the project is critical, as it will determine how easily the truck actually functions as a camping unit and how well the functionality of the system contributes to the ease of packing and unpacking and organizing all of our gear. This has always been an issue in one way or another on virtually all of our other expedition vehicles. The goal is to acheive a truck that can carry a large volume of equipment that is well organized, can be readily packed up or unpacked and will also contain all of the onboard systems that we need for survival. This also must be done without creating a beast that weighs as much as the space shuttle. A tall task for sure, but we are putting alot of time into trying to get this one as close to perfect as possible. If you have missed any of our Building an Expedition Vehicle - Project Unimog updates please click the tab on the right of the blog.